Free Printable Toy Story Characters Word Search. 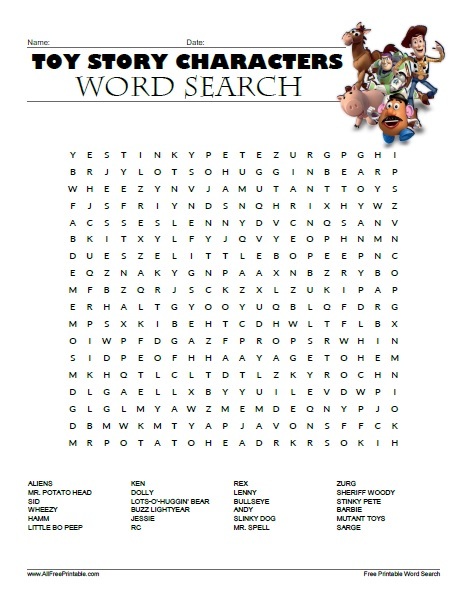 Toy Story Characters Word Search from Pixar’s Toy Story, Toy Story 2 and Toy Story 3 animated movies characters. Print and share with your kids, students, friends, family and everyone that loves Toy Story movies. Great free activity for a movie night, birthday, party or just to have fun. Find words and favorite characters like Buzz, Mutant Toys, Molly, Woody, Sarge, Mr. Potato Head, Stinky Pete, Jessie, Chunk, Rex, Slinky Dog, Andy, Scud, RC, Aliens, Zurg, Hamm, Sid, Lots-O’-Huggin’ Bear and many more. Select from 16 and 24 words activity and the solution on page 2. The Toy Story Characters Word Search puzzle is ready to print in PDF format. Instructions: Click the print link to open a new window in your browser with the PDF file so you can print or download using your browser’s menu.